Again, the same type of tanks. This whole area seems to be very 'hazardous': In the middle we have the fuel tanks, and in the foreground we have the Weapons Assembly and Storage building. It is protected by a sand berm set up to keep the explosion spreading upwards instead of outwards and destroying outlying buildings. This was used in Cruise Missile and F-117 trials. 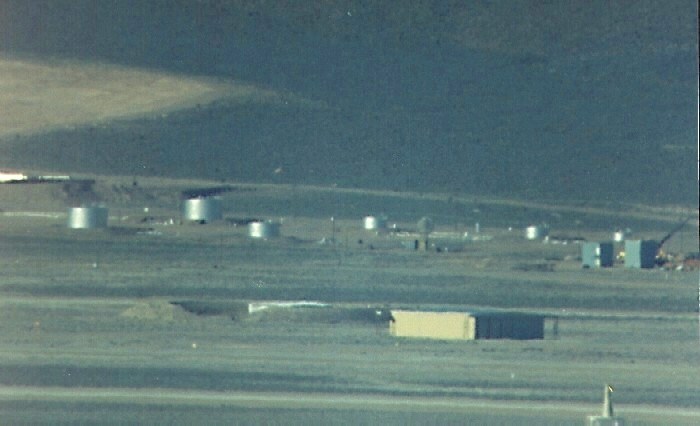 The large building to the right of the weapons bunker is Hangar 19. It is used for Weapons Arm and De-Arm of aircraft. Runways and the VOR can be seen in the foreground.